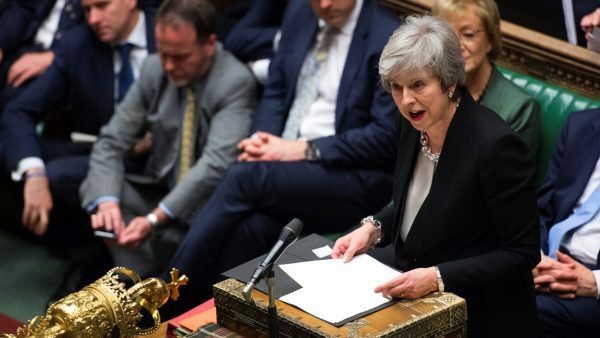 LONDON—British Prime Minister Theresa May was on a collision course with the European Union on Jan. 30, after lawmakers demanded she renegotiate a Brexit divorce deal that the other members of the bloc said they would not reopen. Less than two months before the United Kingdom is due by law to leave the EU, investors and allies are trying to gauge whether the Brexit crisis will ultimately end up with a disorderly Brexit, a delay to Brexit, or no Brexit at all. Two weeks after voting down May’s Brexit deal by the biggest margin in modern British history, Parliament demanded she return to Brussels to replace the so-called Irish backstop, an insurance policy that aims to prevent the reintroduction of a hard border between Ireland and Northern Ireland. “There is limited appetite for such a change in the EU and negotiating it will not be easy,” May told lawmakers who voted 317 votes to 301 to support the plan, which had the backing of influential Conservative lawmaker Graham Brady. “I agree that we should not leave without a deal. However, simply opposing no deal is not enough to stop it,” said May, an initial opponent of Brexit who won the top job in the chaos following the 2016 referendum. May said she would seek “legally binding changes” to the divorce deal which she clinched in November with the EU after two years of tortuous negotiations. In essence, May will try to clinch a last-minute deal by using the implicit threat of a no-deal Brexit from the other 27 members of the EU whose economy is, combined, about six times the size of the United Kingdom’s. The response from European capitals was blunt. France, the EU’s second most powerful member, said there could be no renegotiation and demanded a “credible” British proposal. Germany has so far not given a public comment. European Council President Donald Tusk said the divorce deal was not up for renegotiation. Many company chiefs are aghast at London’s handling of Brexit, which has triggered the deepest political crisis in half a century, and say it has already damaged Britain’s reputation as Europe’s pre-eminent destination for foreign investment. British lawmakers rejected two amendments that set out a clear path for parliament to prevent a no-deal exit if May cannot get a deal passed next month. 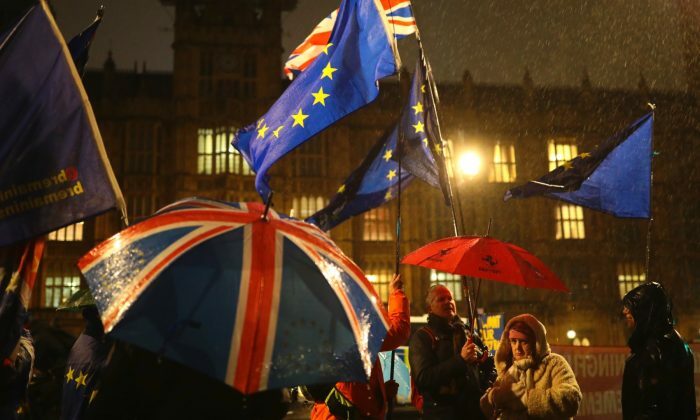 However, they did later approve a proposal calling on the government to stop a potentially disorderly no-deal exit, sending a signal that a majority oppose such a departure. “Parliament at large signaled that it opposes a ‘no deal’ Brexit, but it is not ready to delay Brexit to rule out ‘no deal’ entirely,” Goldman Sachs said. Goldman raised its probability of a no-deal Brexit to 15 percent from 10 percent, kept its probability of a delayed Brexit at 50 percent and revised down its probability of no Brexit to 35 percent from 40 percent. Carolyn Fairbairn, the head of the CBI business lobby, said she did not think any company would have taken reassurance from the events in parliament. “Renegotiation is a throw-of-the-dice, it must succeed or fail fast. Rejecting no deal is welcome but doesn’t get a deal,” Fairbairn said.